Our new 2018/2019 season football ground map poster is double-sided. Side A features the 92 Club, including all grounds in the Premier League, Championship, League 1 and League 2. Side B is brand new for this season and features all 67 grounds in the top 2 levels of the non-League pyramid - the National League, National League North and National League South. Want to display both sides on your wall? Simple, just buy our special multipack containing 2 posters and display them both! Track your progress towards both the 92 Club and the National League's 67 grounds. Tick, cross, colour or highlight. Your map. Your way. The 92 Club is well-known by football supporters, and your progress towards doing the 92 can be tracked right from your bedroom wall with the 92 Club football stadium map. Our map, is fully updated for the 2018/2019 season and includes all 92 teams and grounds in the top 4 divisions in English football, from the Premier League and Championship through to League 1 and League 2. Whilst the 92 Club might be the holy grail for football fans, there's plenty more grounds out there to visit. That's why we've created this - the world's first non-League printed poster showcasing the location of all 68 teams from the top 2 divisions in the non-League pyramid. Our map allows all non-League fans to ticks off the grounds they have visited and plan their next trips with this stylish poster. 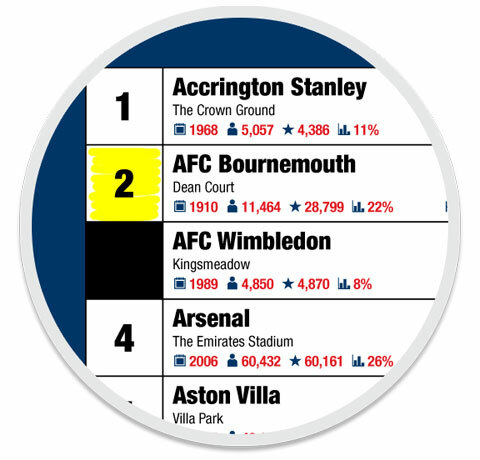 The A1 sized map (59.4cm x 84.1cm, 23.4in x 33.1in) is the perfect fit for any stadium hoppers wanting to track their progress right from their bedroom or office wall. Printed on the highest quality 170gsm silk paper, our map is durable and looks great!